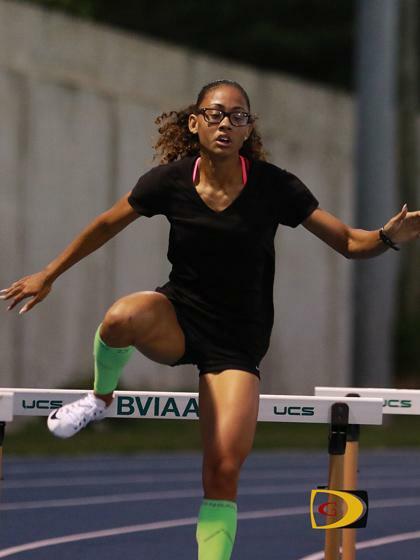 Lakeisha "Mimi" Warner chopped 1.07 seconds off her personal best en route to taking down Pat Archibald's 22-years 400m Hurdles National Record mark of 60.0 seconds hand time from 1984, among three major highlights of Friday's BVI Athletics Association Development Series meet. Warner, who took up hurdling just a year ago, ran 1:00.00 to slice her best from 1:01.07. In the process, she became the territory's first athlete to qualify for the IAAF World Jr. Championships in Poland, later this summer. "Usually, my first hurdle is my best hurdle, but this time, it was the opposite-that was one of my worst hurdles," Warner reflected. "When I realized that my steps were off, I had to pick it up so that when I attacked the next hurdle, everything would be good. But, when I came home, I tripped. I don't know how I tripped but I did. I was like 'oh my God' and I just ran to the finish line." Warner said the next time she hurdles her aim is to go under a minute, "if not 58, 59 for sure, that's just for the next race." To obtain that goal, she said she has to work on her steps to the hurdles and ensure she eliminates the stutter stepping she does coming home. "That's where I need more practicing because I feel the endurance there and the speed there," she pointed out. "It's just to perfect the race now and I'm still learning as I go along how to do it." Warner, who has a 2:10.92 best in the 800m, said transitioning from the half mile to the hurdles has been good, as it gives her the endurance for the 400m Hurdles which she really needs. She added that as she goes along, she realizes that the 800 puts her in a position where she need to be for the 400 Hurdles. "I just had to learn how to gain back my speed for the 400 hurdles and I was good," she said. Is she giving up the 800m? "No, not at all," she stated. "I still need it for my 400m Hurdles so sooner or later, I'll be in an 800." Meanwhile, Virgin Gorda's Britney Peters of Raw Skillz Track Club moved to No. 2 on the Javelin Throw All Time List with a heave of 39.01m, an improvement on the 37.39 season opener. She also had a throw of 38.65m. The soon to be 15-year old pair of Josh Hill and Rackeel Jack, renewed their spirited 800m rivalry that always end in a dramatic finish. Hill held off the charging Jack for another close victory, 2:02.96-2:02.98, as both chopped 10 seconds off their best. Jack is also coming off running 51.08 seconds in the 400m, the second best U16 performance all time. At the New Balance Games in New York City, Tarika "Tinker Bell" Moses chopped Bianca Dougan's five year-old 600m Indoor mark from 1 minute 35.08 seconds to 1:31.92. She was second in the competition. At the same meet, Ashley Kelly won the 300m for Elite and Pro athletes in 37.91 seconds with Karene King finishing third in a personal best 38.97.